A favorite among celebs’ children, such as Nicole Richie’s daughter, Harlow, and MyPacifier.com offers oh-so-adorable personalized pacifiers! 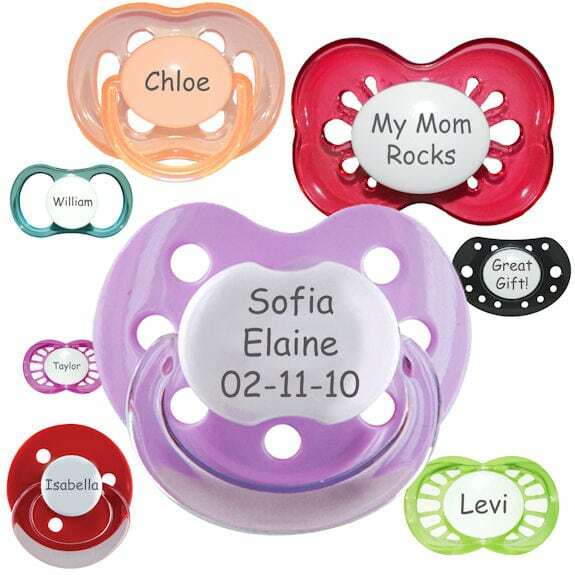 You pick the personalization – from your son or daughter’s name, date of birth or quirky saying – and place it on a variety of pacifier choices. Choose from orthodontic pacifiers, symmetrical pacifiers, round pacifiers, or the popular Nuby style, with super cute stars or flowers adorning the sides. MyPacifier™ has thought of everything – your child’s name is permanently engraved on the pacifier itself, which ensures that it cannot be worn off even after repeated sterilizations. Your child’s pacifier will never be lost or misplaced while at daycare or accidently placed in another child’s mouth again! MyPacifier™ make fabulous baby shower or birthday gifts and are just too, too cute! Visit MyPacifier.com to order your personalized pacifiers for your favorite little one today. Previous Post: « Who Needs A New Hula Hoop? I Do! I Do!